Late last night, I flipped the final virtual pages of Sinclair Lewis’ The Job: An American Novel (free for Kindle!). The Job spanned a decade starting in 1905, when Una Golden and her mother moved to New York City from a small Pennsylvania town. Una’s father had just passed away, and after the dust settled, the mother and daughter decided that a big city like New York held more opportunity for a young woman to earn a living (and support her mother). Such “opportunities” were vastly different than what women expect today. After a quick stint at secretarial school, Una started her career by taking dictation, eventually running small offices. Throughout, her fellow secretaries and stenographers married and left their jobs. The message – and reality – were clear: women had to choose between work or family. Women tended to work only when they had to support themselves in the absence of a father or husband. Una struggled to reconcile her desire for a family with her career aspirations. As I read, many of the office dynamics were familiar, with hierarchies and break time confidences. But I marveled at just how far we’ve come in a century. My own company, IBM, recently named a new CEO. 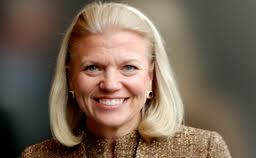 As of January 1, Ginni Rometty was named President and CEO – IBM’s ninth CEO in a century. When the news was announced in October, the gender-focused headlines bothered me. Why should it matter that she’s a woman? That our best and brightest, someone who worked her way up through IBM’s ranks since 1981, happens to be a woman? We should applaud the best person getting the job, regardless of gender. But not terribly long ago, that wasn’t really the case. When my mom applied for teaching jobs in the 1970s, she had to include a headshot and answer questions about her marital status and whether she intended to have children. It’s certainly changed in the century since Una Golden arrived in New York. Even so, I look forward to the day when gender isn’t highlighted as something novel during such announcements. Congratulations, Ginni, and thanks for helping perpetuate the reality that a woman’s place can be in the board room. The New York Times has an interesting look at women in technology, and specifically, women in IBM. This entry was posted in Musings, Reading, Work & Commute and tagged Books, Girl Power, Work. Bookmark the permalink.